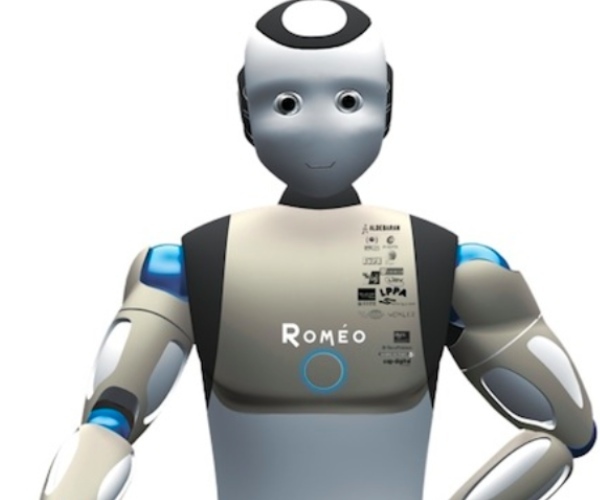 The above image is a rendering of Paris-based Aldebaran Robotics‘s current affair, a humanoid robot named “Romeo.” Romeo will debut next March 2011 at 1.4 meters tall, 40 kilograms with an expected cost of €250,000. Romeo will be able to walk through a home, fetch food from the kitchen, take out the garbage and act as a loyal companion to assist elderly and disabled individuals in their daily activities. As reported by IEEE, Aldebaran claims that Romeo will come with several innovations, including a four-vertebra backbone, articulated feet, a partially soft torso, a composite leg exoskeleton, a new and safer limb control system and an impressive communication system. “We want people to interact with Romeo using just natural speech and gestures,” Bruno Maisonnier, founder and CEO of Aldebaran, told IEEE. Work on Romeo project began in early 2009 with a budget of €10 million, about half of which is government funded. Read next: California Gold Rush 2.0: Are Twitter and Facebook Overvalued?